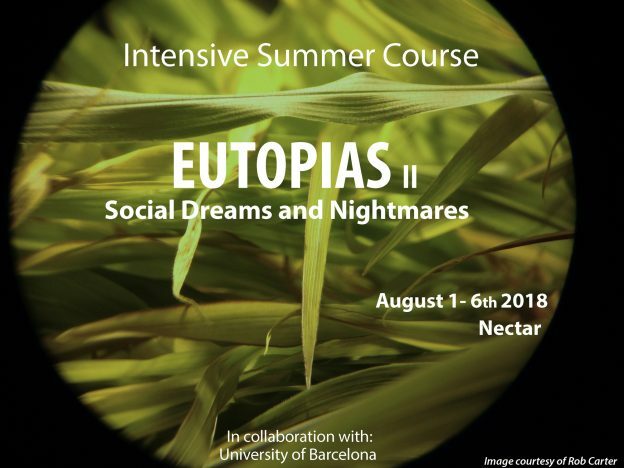 EUTOPIAS II – Intensive Summer Course – ON MEDIATION & Nectar ¡REGISTER NOW! EUTOPIAS Summer Course is a yearly seminar on contemporary art and utopia, hosted in the beautiful country house of Nectar. In its second edition, EUTOPIAS departs from the idea of the existence of certain utopian prototypes, such as the ideal city, the commune, or the generous garden where nature flourishes in an eternal spring. Throughout its sessions, this year’s programme will examine contemporary interpretations of these mythical spaces through the work of contemporary artists. Other topics, such as speculative fictions, feminist cosmologies or alternative institutions, will also be explored from this point of view. EUTOPIAS, however, is not only an academic experience: all sessions take place in the Nectar house in the middle of the natural park of Les Guilleries. Living together, participants will experience a utopian lifestyle while reflecting on artistic interpretations of the good life. Theoretical sessions will be complemented by practical workshops, conducted by Spanish architect Uriel Fogue, French artist Lise Lerichomme, cultural manager Olga Sureda and Israeli artist Tai Lomas. Course directed by Julia Ramírez Blanco. On Mediation is a platform on curatorship and research from the research group Art Globalization Interculturality (AGI), University of Barcelona, OM addresses different curatorial perspectives that identify distinct ways of doing and which drive curatorial practice towards a post-disciplinary setting. Among other activities, On Mediation offers an International training seminar that has a first theoretical phase, given by curators of recognized international experience, and a second practical phase, where participants can develop the ideas put forward during the seminar through a tutored curatorial project.